Ambling through life with my best possible thinking. Bald eagles. A creature that knows how to soar. Do you? In the above photo, four bald eagles glide on the winds above our home. There were actually five but I was only able to capture four with my iPhone camera. Wonderful things happen to me in spring. Eagles, for example. My wife, forever in tune with nature and the animals and birds, who are our brothers and sisters, alerted me to this scene. The times that I have soared in life—they have almost all been kicked off by a mild, lovely spring. If you’re a young person, I would encourage you to be like these bald eagles: Find some wind, hop aboard, and ride. School will be out soon. How will you soar this summer? Perhaps you will find a job that really winds your watch. Or, maybe you’ll discover a volunteer opportunity that becomes a life-long interest. When I was a dog trainer, I was a senior trainer, meaning that I trained other trainers. One of my favorites was a young man still in high school. He learned from me and began earning part-time money during the summer, doing something he loved! Stranger things have happened. Be open to the possibilities. Let spring glide you toward a useful summer. It’s also a great time to curl up with a good book. Okay, I admit: For people like me, almost anytime is good to curl up with a good book. Speaking of books, I have one coming out sometime this year. Chattahoochee Rain is about a 13-year-old girl, Annie, who lives in the old Cherokee Nation. She is trying to soar; that is, she’s trying to grow up in a way that will make her and her family proud. Are you doing that? Don’t grow up too fast! (It’s overrated, adulthood). Take your time this spring. Learn to soar. Most important of all, be you. Don’t let others guide your thinking. And don’t forget to read! Reflection. It's something I do, partially because it is who I am but partially because my health status forces it. I have reflected lately more on what I have than what I don't, a rarity for me. See, I'm a godforsaken pessimist. I set out to be as different from my father, may he rest in peace, as I could be with respect to outlook, but life has gotten the better of me more times that I can count. Despite this reality, I can always see the sun peeking from under the thick, burnt volumes of clouds. If I could not, I would have been dead long ago. In the photo above, an eagle is taking flight (upper right, one o'clock). The pic was taken from the ferry to Bainbridge Island almost a decade ago, before my wife and I moved out here. Speaking of Penelope, she and the American Bald Eagle have a sisterhood. It is powerful. I would advise the curious to question that sisterhood only at their own peril. Like the eagle, my wife soars, and for that I am grateful. When she's not riding the breeze, surveying the landscape, she's swooping in to manage her roost. - represented here by a seraph who never lets me down and dear friends that appear when most needed - belies the ugliness of my constant and significant physical breakdowns. I am reminded of the Seattle sunset and how blessed I am to have seen so many. I have had a lot more yesterdays and tomorrows than I deserve. Despite it all, I celebrate the peace and mystery of this holiday season. And I cherish the one with whom I have ridden the breeze during my more robust days, as well as those friends who, both two and four-legged, extend the kindness and compassion that Jesus of Nazareth and those like him professed. As a seminary professor said in the vesting room at my graduation so many years ago, "These are great days!" My excellent friend, Becky, is called to listen. More than once, she has helped me negotiate some complicated Cherokee “stuff.” Each time, she listened without a single interruption. An enrolled member of the Cherokee Nation, Becky is good at listening for the key points of your struggle. We need more listeners like her. Listening involves a presence; we are either present for the other person or we are not. Becky generates a real presence, and the lucky talker knows that he or she is being heard. How can more of us be like Becky? The art of listening involves the emptying of the self, enough that the other person is validated. Becky validates because she responds from a place of love and empathy. I have another dear friend who has invested significant emotional time and energy over the years in someone that, as long as I’ve known him, can’t seem to stop talking about himself. He is his favorite all-time subject. He cheats the oxygen in the room. Unfortunately for all concerned, nobody has ever bothered to tell him that he talks too damn much. He refuses to shut up, especially if he might be called on to demonstrate the slightest intimacy skill. His self-adulation prevents any meaningful dialogue for my friend, and it has been hard to watch. Due to this man’s behavior, my friend can never fully share, and almost always comes away feeling shut down. It is often said that listening is a skill. I think that it is just as much a choice. It is a choice that we make, to be available for the other person in a way that so many today are unavailable. Be like Becky. Please, oh please, don’t be like my other friend’s emotional investment. Replenish the precious oxygen in the room by answering the call to listen. Are you in the “responding” business? A friend and colleague, Todd, is in the responding business. We are roughly the same age, and have a few things in common. Years ago, when we worked together, Todd and I expressed a mutual desire to maintain interpersonal relationships only if they meant something to the other person. That is, reciprocity was important to both of us. We both confessed frustration regarding persons who seemed to enjoy initiating relationships and, at some point, dropping off the radar, as if the relationship meant nothing to begin with. I am blessed in so many ways, and one of them is the knowledge that Todd continues to respond, to hold our friendship in high regard. I think we are called to respond; that, yes, I see it as a calling in and of itself. Being called to respond is a sign of an educated heart. Whether we are responding to another person or a situation, the measure of our integrity is often revealed in how we acknowledge or reciprocate. Are you being called to respond to someone or something? It’s important to know that we always have the choice not to respond. We have the right to remain silent. If that is the choice, let us hope that we know exactly why we’re not responding, for our sake and for the sake of others. For those to whom we wish to respond, and who choose to respond to us, let us be thankful. During the recent royal wedding, the Presiding Bishop of the United States, The Most Rev. Michael Curry, did what he was called to do. He did, simply, preach the love of Jesus as he understood it. Despite rather pathetic efforts to alter perceptions, Bishop Curry honored God, the bride and groom, and the church he represents. It is unclear to me how he might have made things less than they should have been. Now, I never thought I would be one to defend an Episcopal bishop; not by a long shot (not that this gentleman needs it). The Episcopal Church and I have had our battles. There was a time when elements (two bishops, especially) of this entity of the Christian church treated me with unfounded disrespect, and in ways that shut me down as a human being. That was a long, long time ago. Since those days, I was invited to be a staff member at a wonderful Episcopal parish in North Carolina, one with which I had been intimately familiar since childhood. During that incredible period of my ministry, I had the pleasure of meeting Michael Curry and visit with him—clergy to clergy, listening to his thoughts about how Jesus enters our lives and empowers us to bring the sacred to the lives of others. 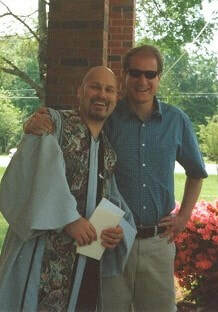 He did this with humility and positive exchange, being more than open to one ordained in another tradition. We laughed together that day, and I realized he was in possession of something frequently absent among those in the ordained ministry: a wonderful sense of humor. One of the things that impressed me was how different Curry was—in the ways of the heart—than some of those bishops I had previously encountered. Bishop Curry struck me as genuine, loving, and he expressed a gift in the pulpit uncommon to most that I had witnessed in the Anglican way. That is to say, the man had soul. In this age where so many strive to be “correct,” particularly in their respective theologies, I can’t help but wonder what has happened to the concept of perspective. All points of view are valid, and it isn't always about being right, but being faithful. I am reminded of how far we have yet to go. Believe it or not, some folks aren’t always harboring an agenda. Some do what they do for the sake of the Gospel, despite the wretchedness of others. 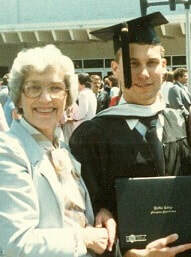 With my mother, Jean, college graduation, May 1985. Service to our higher power and to one another promotes well-being. It is usually through service that we find our calling. I would not presume to speak for my mother, no longer with us, as to her primary calling. It was evident to me, however, that she was called to serve at different junctures in her life. Her witness to my life, and to the lives of others, is well-remembered. In 1872, the Board of Missions in the Episcopal Church created “The Woman’s Auxiliary,” which later became the Episcopal Church Women, or ECW. Mom was a member of the ECW for many years and developed friendships with some of the greatest women ever. Mom and her fellow ECW members contributed a great deal to the world, and being with them always gave her a sense of that well-being that I mentioned. She was dedicated to God and to her parish. My mother was known as “Nana” to my sisters’ children. She had the ability to give each grandchild the sense that he or she was special. Mom enjoyed her grandchildren immensely, just as she did her own children. She was the matriarchal “glue” that helped hold our family together. If you wanted to know what was going on with a particular family member, you just had to ask Jean; she had the scoop. Part of my mother’s servant ministry was being a loving presence for us and others who were fortunate enough to have crossed her path. My sister, Carol, reminded me on this year’s Valentine’s Day (by sending me a “Superman” Valentine card) of how Mom, during my pre-school days, transformed a pair of my pajamas into a homemade Superman costume and pinned a red towel on me for use as a cape. Every day at 4:00 p.m., when the original “Superman” series aired, I would lie prone over our cushioned footstool and pretend I was flying. Now, if that isn’t service for the sake of a child, I don’t know what is! February 14, 2018, marked what would have been my parents’ 65th anniversary. It’s a bittersweet day, made even more so as I reflect on my mother’s service to the world. May 14, 2000, was a special day for me. It was Mother’s Day, the day I was ordained. It marked another progression in my spiritual relationship with my mother, who died the previous year. I recall contemplating, as the congregation laid hands on me (beginning with the children, a personal request), how a year earlier, as my mother lay dying, I had promised her that I wasn’t through—that I was just getting warmed up. It was an emotional moment, for sure, yet one laden with conviction. I think my sense of service and restoration came from her. In what manner of service are you called this year? This month? This week? 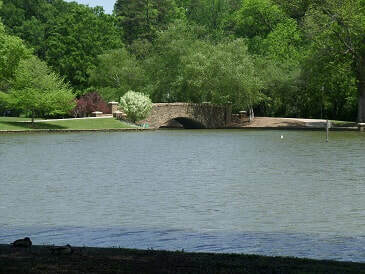 Did you know that in the mid-20th century, particularly during the Vietnam War, Charlotte's Freedom Park was used as an occasional training area by Special Forces (Green Beret) reservists? They would "track" in the woods, and practice crossing Little Sugar Creek upside-down using line training. Charlotte was a great place to learn to play. When I was a kid, the Nature Museum (now Discovery Place Nature) was my favorite “get out of jail free" (school!) card. The mammals, reptiles, birds, and bugs liberated me from the musty classrooms of my youth. The animals were always easier to relate to than other people. Ask almost any native Charlottean over 50 about their favorite childhood haunts and the Nature Museum is bound to be one of them. Of course, it was (and is) a place of learning, but it called me to play. It was the same type of thrill going to Freedom Park in those days. We would run around the big train, and climb on the engine. The park had a couple of old fire engines, an army tank, and a fighter jet and we had great fun climbing those, too. We would play in the creek, and do the things that children did in the carefree manner that reflected the spirit of the times. Likewise, Veteran’s Park, on Central Avenue, was another popular park that in earlier days had the classic pump-action swings, where, the harder one pumped the handles, the higher one would go. Play would come, but we were forced to use our imaginations to create our circumstances, which were not dictated to us by technology as it is today. Moreover, I can still smell the musty hard and softcover books at what was then the Commonwealth Branch of the Mecklenburg Public Library. When I was a small child, my mother would reward me by taking me to the library for two or three books. Fortunately, the love of books stuck with me. Aside from being part of my work, they will always be a source of play for me. Another favorite was the Saturday morning visits to the “uptown” (as my dad called it) Sears. The aroma of roasted nuts permeated the place, and I loved the model train that seemed to run the entire length of the lobby when we walked in. I think the trips to Sears may be part of the reason why Saturday became my favorite day of the week. Saturday was sometimes the day that brought new football cleats, a new baseball glove or basketball from places like Sears, the Collins Company, and B & R Sporting Goods. Later, I would be called to “play” when my father would take me to lunch at Hardees (a big deal in those days) on Eastway Drive. It was next to the post office and had one of the original “witch hat” roofs. After lunch or “supper” there, we might go to a Charlotte Checkers hockey game (I still have an authentic puck from 1973) at what I now like to think of as the “old” Charlotte Coliseum. Dad and I would go to Charlotte’s Park Center so that I could see Mid-Atlantic Championship Wrestling. This was my first exposure to the likes of Johnny Valentine, Paul Jones, Super Destroyer, Andre the Giant, and of course, “Nature Boy” Ric Flair. Early in his career, Flair lived up the street from us in Parkview East. I think the Nature Boy was called to play (though it was also part of his professional image as a “heel”) when he would stroll down his driveway, flex his muscles, and stare at us as we drove by. I’m delighted to see that Flair’s daughter, Ashley (“Charlotte”), continues the family tradition in the squared circle. Sorry, Ric; she’s a heck of lot more fun to watch: Your Figure-Four Leg Lock may have made the world stop, but when Charlotte does her Corkscrew Moonsault, the world reverses, starts, and then backs up again before restarting. Chick power with "flair." Woooooooooh! My first job, believe it or not, was at the movies. The remains of the Capri Theatre rest at 3500 E. Independence Boulevard, and I had more fun working there—and got into more trouble—than any teen should be allowed to have at work. Sometimes, when the matinee sold out, they would send me across the road to The Ramada Inn, so that the Capri would have cash and coin for the next show. I had fun playing “chicken” with the cars on the way back. Charlotteans were forgiving in those days. During last year's visit to Charlotte, I smiled as I drove past the old Capri, because East Independence is now a highway divided by two, three-foot-high medians, and I doubt I would try crossing it today without the assistance of a Ranger platoon or a SEAL Team. At least some of life should be fun. Are you called to be at play at times? This will be excruciating if you spend your days around people who are so uptight that they must unbutton their collar to use the restroom. You know the type: the ones who can’t see their reflection in the mirror. ​Have a little fun; be at play. You deserve it! Help others to play from time to time. They deserve it, too. When I write about “witness,” I want to be clear about its broader meaning. Some will assume that because I am a Christian, hold ordination, and am from the south, that I am talking about “witnessin’ for the Lord,” or something to that effect. If you’re headed down that road, please, slow your roll. We can stand witness to a number of things besides the Creator, not the least of which might be one another. Thirty-two years is a long time to stand witness. In an earlier post, I mentioned my own conceptualization of family. I have a de facto brother, Ken. Once upon a time, on a pungent chemotherapy ward (as they were known then), one of my nurses walked into my room and asked if I would talk to the 17-year-old down the hall. He had, she said, the same type of cancer I did. That evening kicked off something more than friendship. A brotherhood was formed, based on shared experience, and try as I might, I haven’t been able to shake the guy for three decades. Actually, I’m glad. He’s been a witness to many of the life-altering events of my journey. We have been closer, as one might imagine, than many biological brothers. His favorite pastime is to annoy me with his adolescent texts and phone calls, but I love the big Neanderthal. There is a saying, “Don’t just do something—stand there!” Witnessing sometimes means just being a caring presence. Ken stood witness to my battle with cancer, particularly its aftermath. He watched the emotional and psychological toll it took on me. He witnessed my divorce and its recovery, and the powerful and meaningful existence I carved out with canines as a means of both theology and personal philosophy. He witnessed the metanoia (change of heart, as in “Change your hearts and lives, and believe in the good news!” from Mark 1:15, CEB) that I underwent as I responded to God’s call to seminary and professional ministry. Twenty-one years after our struggle together in the trenches of cancer treatment, Ken was called to witness another medical challenge when he took precious time to travel to the North Carolina Mountains after I had a heart attack on a cold day in Asheville, where we lived. In more recent years, as my health would deteriorate, the phone would ring at the times when I was contemplating the meaning of a life of pain or, more importantly, whenever it was time for the Carolina Tar Heels to beat the hell out of the Duke Blue Devils (as happened recently). When a major life decision or change is on the horizon, Ken calls. I mean, the guy has a sixth sense. His witness has meant a great deal for a long time. Are you called to witness? Consider the upshot of giving testimony to the life of another. Think of the potential in good will, life-long relationship, memories, and harassing phone calls you may be in for. That’s the good stuff. For whom are you called to witness? How will the act of witnessing help you help someone else? Give it a shot. The experience will probably change your lives for the better. The Rev. Billy Graham was a native Charlottean. That is one of the things we had in common. Like Rev. Graham, I was called to the ministry, and we shared a love for the North Carolina Mountains. He will be missed by many, especially in the South. Rev. Graham (“Billy”) was instrumental in my return to the church as an adult. His simple message of “God loves you and He has a plan for you” resonated with me. It was a message I needed to hear at the right time, for the right reasons. If he moved beyond that message, however, as he had in earlier years, that’s when I cringed and retreated. I’ve never been one for compulsory faith. The “You must make a decision!” theology can be a dangerous one. Consistently, conservatives could never get enough of Billy, and liberals had little, if any, empathy. When Billy and President Kennedy met, it must have been one interesting conversation! When he was young, Billy was not a fan of Catholics (or Jews, for that matter) and he made his views known. Later, Billy came to see people of other traditions and faiths as trying to do what most of us try to do—to live in concert with the God of our understanding. His message, generally, became more about God’s grace than human transgression. He was resolute in his stance that the ultimate path to God was through Jesus only, but his willingness to reach out to persons of other faiths increased with age, something a lot of Christians could learn from. Though worlds apart in our respective theologies and social philosophies (I don’t believe that my gay brothers and sisters are sinful by virtue of following their hearts, for example), Billy and I were probably more alike than different. Regarding the pureness of his heart, I have no doubt. I thought Billy’s address to the nation at the National Cathedral the Friday following the September 11, 2001 attacks was hopeful and relevant. Billy’s resolution to live a modest life as he comprehended it was admirable. I remember reading in his autobiography that although the Billy Graham Evangelistic Association was doing well, he refused the adoption of an airplane on moral grounds. He didn’t think it was right for the ministry to spend money on something like that, which is more than can be said for some of the televangelists of today. The Rev. Billy Graham grew up about 10 miles away from where I did. He was ordained to the Gospel Ministry, as was I. He had a great love for the Blue Ridge Mountains, as do I. He was conservative in his theological and social stance, whereas I fall in that grey area of “moderate” that irritates so many from the extreme ends of the liberal and conservative spectrum. More important than all of that, though, is that he was Billy. Like him or not, you knew where he stood. He was a true and faithful rider of the horse that rode hard for the Jesus of Billy’s understanding. He had an enormous impact, preaching to as many or more people than the apostle Paul, and for that alone, he deserves our respect. Thank you, Billy, for your service. In an earlier reflection, I mentioned that dogs changed my life. I landed a job training dogs during a difficult transition. The relationships that were formed, the bonds created, the love of a human for another species—these were the things of dreams. Our own companions have seen me through a lot. The dogs that Penny and I have shared space with over the years have listened to my complaints, my plans, my sermons, my articles, my stories, and my fears. They helped me cope with intense clinical training, seminary papers and exams, the deaths of my parents, and job loss. They supported me through two heart attacks, a lung tumor and its surgery, the deaths of patients and friends, multiple relocations, and a host of other stress-inducing elements of life that are common to us all. When I first began training dogs, it was a hobby. Later, it turned into a vocation. As time passed, I realized that these creatures communicated with me in ways that defy adequate explanation. It is a spiritual connection; a sacred partnership based on trust. I was called to companion with these beings at just the right time, for just the right reasons. They believed in me, and I in them. Yes, even the protection dogs that were trained to “hit” my arm in its protective sleeve were often discriminating enough to still be my buddy. In an upcoming book, Called Yet Again, I discuss the aspects of my kinship with the canine through the lens of Scripture, tradition, reason, and experience. Within the context of reason and experience, I propose that the domestic dog is a participating member of the family system, and that the dog is capable of enough reason to define itself to others by virtue of its own emotional intelligence. In addition, the “Gih’li,” as the dog is known in Cherokee life and thought, has never once lied to me or tried to manipulate me into believing that I’m less than I am. The animals, especially the dogs, have given me far more than I’ve given them. They are more like us than different, and communing with them has been one of the great privileges of my life. Are you called to companion with nature in some way? I would love to hear about it. "YOH-nuh" (yonv) means "bear" in Cherokee. Thanks for visiting!